Iraqi-born Farah Alkhafaji, persecuted after aiding U.S. troops in her native country, is challenging the Trump administration’s travel ban with a refugee aid group. Photo by Cassandra Reinhart. In the glow of Laguna Beach’s setting sun, you can see that Farah Alkhafaji’s eyes have seen too much for her 35 years. The Iraqi-born Alkhafaji started supporting the U.S. military in Iraq in 2003 at the age of 19, providing the troops with logistics, engineering supplies, and translating for them. As a result of her support and commitment to the U.S. troops, her family was persecuted. 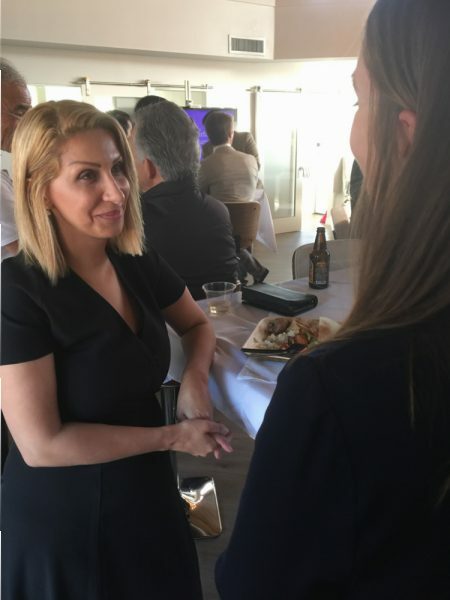 Alkhafaji, and Becca Heller, the director of the International Refugee Assistance Project, or IRAP, told their stories Tuesday at an event in Laguna Beach observing World Refugee Day. IRAP is on the frontlines of the controversial refugee ban playing out in front of the U.S. Supreme court, as the lead plaintiff in the case that challenged President Trump’s executive order banning travelers from several countries. New York-based IRAP is made up of a 31-person team that provides free legal representation to the worlds most vulnerable refugees fleeing prosecution including Afghan and Iraqi individuals, like Alkhafaji, who assisted U.S. troops in those countries. To date, IRAP has resettled over 3,600 refugees from 18 different countries, and have provided some kind of legal assistance to 20,000 individuals. The project has helped pass eight pieces of federal legislation in the past few years to provide Visas or human rights to over 160,000 individuals. The presentation was put on by the Interfaith Refugee Project, which has partnered with four organizations—HIAS, Islamic Relief, World Vision and the International Refugee Assistance Project, to connect people to organizations helping refugees regardless of religion, race or other identity-based categorizations. Alkhafaji told guests her story of how IRAP provided her and her two children a safe home in Baghdad until they could fly out to Jordan and get to the United States. Now living in Virginia, Alkhafaji remarried a U.S. Navy officer, and manages a clothing store. She says her dream is to work for the United Nations as a human rights advocate to help others in situations similar to hers. The Trump administration filed a brief this week asking the Supreme Court to reinstate the travel ban on nationals from six Muslim countries from entering the U.S. in a last ditch effort before the high court decides whether to take up the case. Through speaking at events like the one in Laguna Beach, Alkhafaji and Heller want to show people the real faces of refugees in the United States.